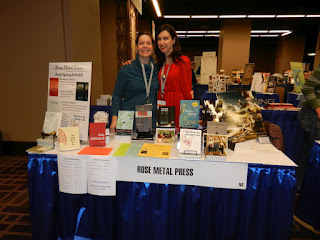 Rose Metal Press spent February 29 through March 3 rocking AWP Chicago! It was a great week and we loved getting to see so many of our friends, authors, and other small presses in the underground maze of the bookfair and at offsite readings and events. 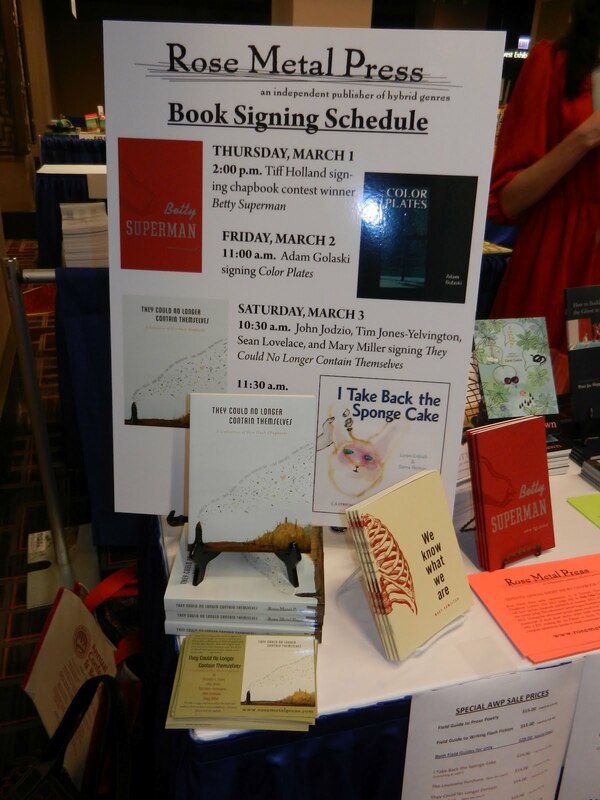 We were excited to have FOUR news books since last year's AWP: They Could No Longer Contain Themselves, Betty Superman, The Louisiana Purchase, and the brand-new-launching-at-AWP I Take Back the Sponge Cake. 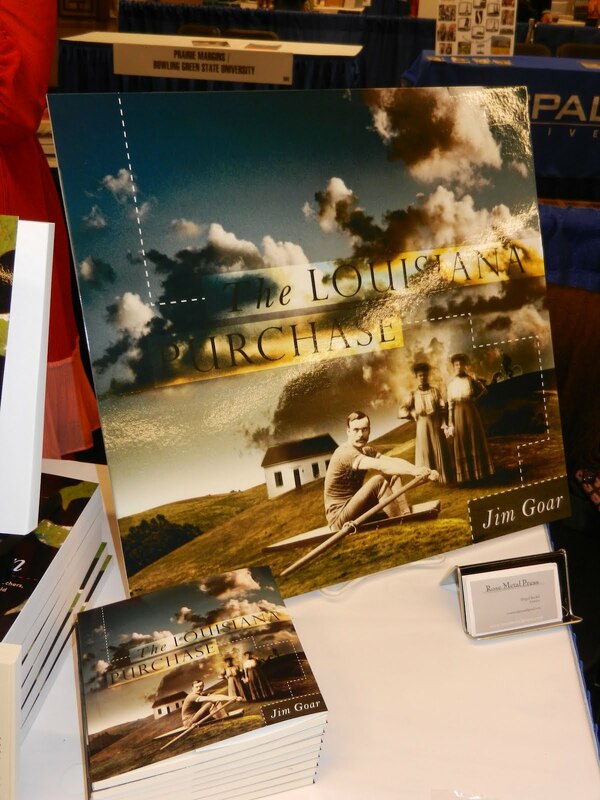 Rose Metal Press authors participated in 3 offsite readings and 4 book signings at the table. 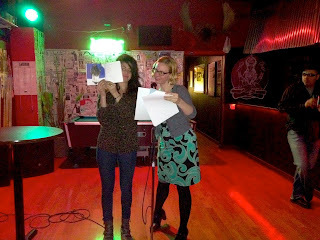 On Wednesday, February 29, Tiff Holland, author of Betty Superman, and Loren Erdrich and Sierra Nelson, authors of I Take Back the Sponge Cake read at Weeds Tavern as part of a joint reading with Lowbrow Press and Hopewell Editions. 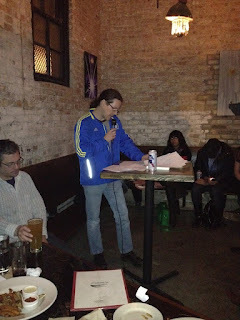 Upcoming RMP author Nicelle Davis also read at the event. Here's a photo of Loren and Sierra reading collaboratively and showing off the book's artwork. They had the audience vote on which choose-your-own-adventure word to pick and the journey continued on from there. This is a video of part of that reading's audience adventure! On Thursday night, March 1, Sean Lovelace and John Jodzio of They Could No Longer Contain Themselves read at Simone's Bar with readers from Bateau Press, Burns ide Review, Slope, Interrupture, and Versal. 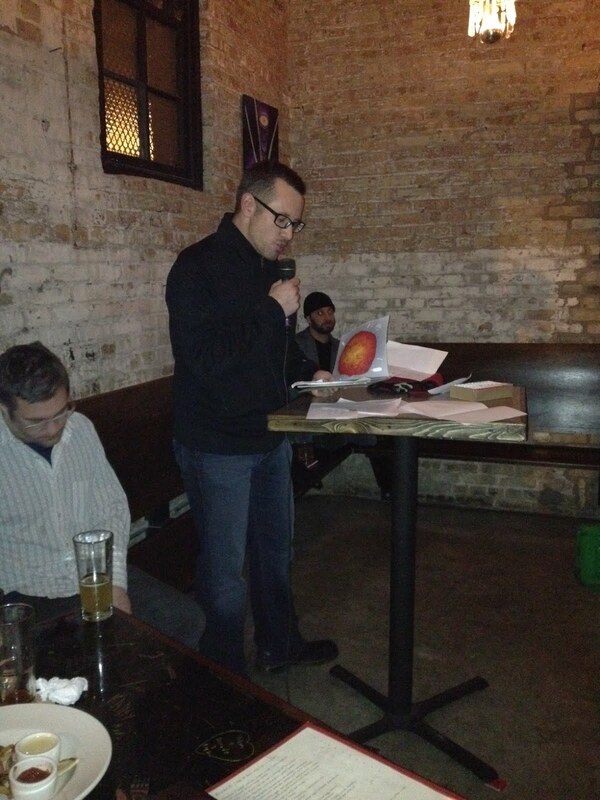 Here are a couple photos from the reading and a video of part of Sean's flash story about Memphis. Saturday night, March 3, Adam Golaski, author of Color Plates, and Loren Erdrich, one half of the collaborative genius behind I Take Back the Sponge Cake read at The Beauty Bar with readers from Gigantic Sequins, Big Lucks, Knee-Jerk, and Magic Helicopter. 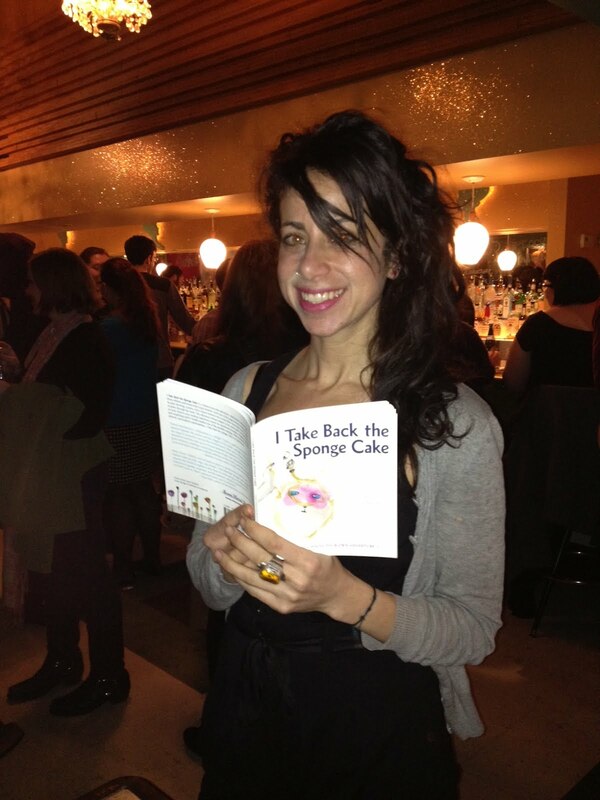 Here's Loren at the Beauty Bar with the newly launched Sponge Cake! All the readings were terrific and we send out big thanks to all the presses and journals that organized and participated in the readings! We had a busy Friday and Saturday--we participated in a well-attended 9 a.m. panel on fiction chapbooks on Friday morning, and met up at various times with exciting new RMP authors Aaron Teel (author of chapbook winner Shampoo Horns, due out this summer), Dinty W. Moore (editor of The RMP Field Guide to Writing Flash Nonfiction, due out in September), and Kelcey Parker (author of the novella-in-flash Liliane's Balcony, publishing fall 2013), as well as hanging around through those last frantic hours of the bookfair on Saturday. Things get pretty crazy there at the end, with broke writers running wild beneath the fluorescent lights trying to find books they promised themselves they'd buy before they left. We took cover behind the table and offered up our new credit card scanner! Thanks also to everyone who stopped by our table to say hello, check out our books, snag some of our sweet new buttons, and find out about Rose Metal Press! We miss you all already! See you in Boston next year if not before!